Where has all this led us? Global “Financial Sphere” inflation has been nothing short of spectacular. QE has added an astounding $14 TN to central bank balance sheets globally since the crisis. The Chinese banking system has inflated to an almost unbelievable $38 TN, surging from about $6.0 TN back in 2007. In the U.S., the value of total securities-to-GDP now easily exceeds previous Bubble peaks (1999 and 2007). And since 2008, U.S. non-financial debt has inflated from $35 TN to $49 TN. It has been referred to as a “beautiful deleveraging.” It may at this time appear an exquisite monetary inflation, but it’s no deleveraging. We’ll see how long this beauty endures. I have posited that aggressive tax cuts at this late stage of the cycle come replete with unappreciated risks. Global central bankers for far too long stuck with reckless stimulus measures. A powerful inflationary/speculative bias has enveloped asset markets globally. Meanwhile, various inflationary manifestations have taken hold in the global economy, largely masked by relatively contained consumer price aggregates. Meanwhile, global financial markets turned euphoric and speculative blow-off dynamics took hold. A confluence of developments has created extraordinary financial, market, economic, political and geopolitical uncertainties – held at bay by history’s greatest Bubble. “Is the Fed’s Inflation Target Kaput?”, was the headline from the above Bloomberg article. There is a contingent in the FOMC that would welcome an inflation overshoot above target, believing this would place the Fed in a better position to confront the next downturn. With yields now surging, these inflation doves could be a growing bond market concern. The marketplace has begun to ponder risk again. Stock prices have been going up for a long time – and seemingly straight up for a while now. Bonds, well, they’ve been in a 30-year bull market. Myriad strategies melding stocks and fixed-income have done exceptionally well. And so long as bonds rally when stocks suffer their occasional (mild and temporary) pullbacks, one could cling to the view that diversified stock/bond holdings were a low risk portfolio strategy (even at inflated prices for both). And for some time now, leveraging a portfolio of stocks and bonds has been pure genius. The above Bloomberg story ran Thursday. By Friday’s close, scores of perceived low-risk strategies were probably questioning underlying premises. 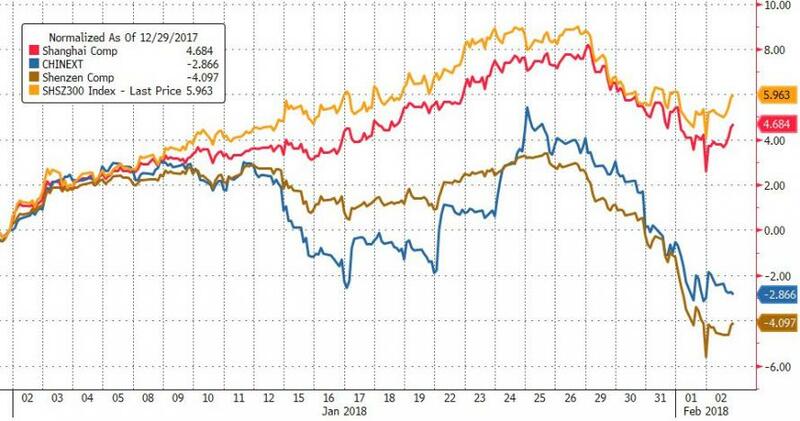 A day that saw heavy losses in equities, along with losses in Treasuries, corporate Credit and commodities, must have been particularly rough for leveraged “risk parity” strategies. The cost of market risk protection just jumped meaningfully. 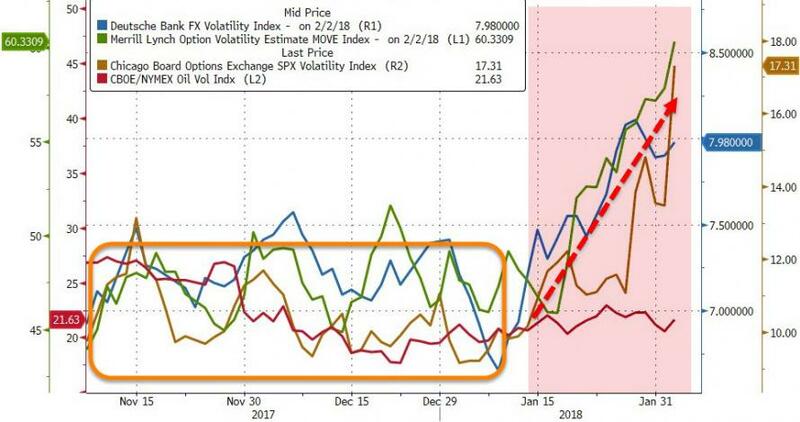 Past spikes in market volatility were rather brief affairs – mere opportunities to sell volatility (derivatives/options) for fun and hefty profit. I believe markets have now entered a period of heightened volatility. To go along with currency market volatility, there’s now significant bond market and policy uncertainty. The premise that Treasuries – and, only to a somewhat lesser extent, corporate Credit – will rally reliably on equity market weakness is now suspect. 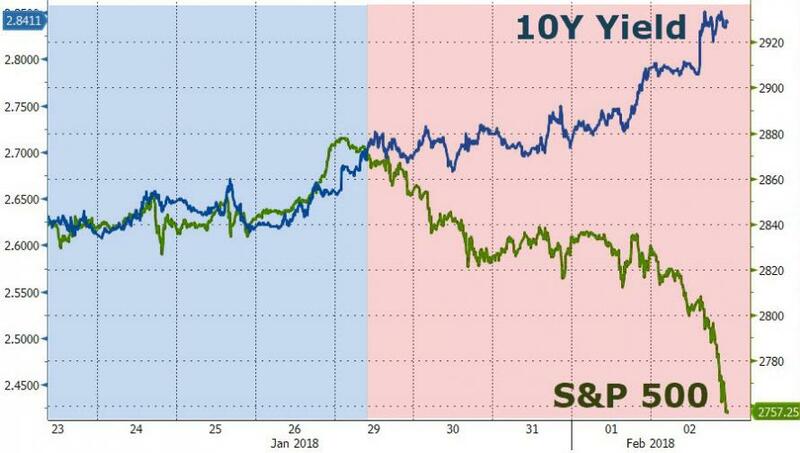 Indeed, faith that central bankers are right there to backstop the risk markets at the first indication of trouble may even be in some doubt with bond yields rising on inflation concerns. When push comes to shove, central bankers will foremost champion bond markets. The Shanghai Composite dropped 2.7% this week. Losses would have been headline-making if not for a 2.1% rally off of Friday morning lows. The Shenzhen Exchange A index sank 6.6% this week, and China’s growth stock ChiNext Index was hit 6.3%. The small cap CSI 500 index fell 5.9%, and that was despite a 2.1% rally off Friday’s lows (attributed to “national team” buying). Financial stress has been quietly gaining momentum in China, with HNA and small bank liquidity issues the most prominent. 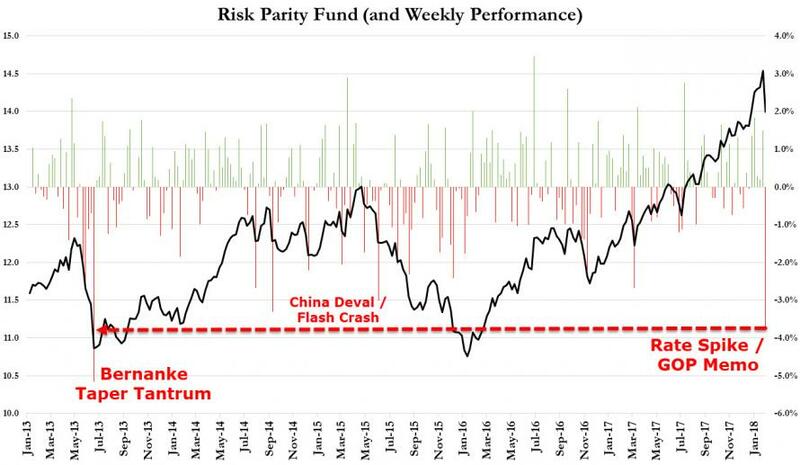 As global liquidity tightens, I would expect Chinese Credit issues to be added to a suddenly lengthening list of global concerns. Here I am, as usual, plugging away late into Friday night. So, who am I to take exception to insight from a billionaire hedge fund genius. 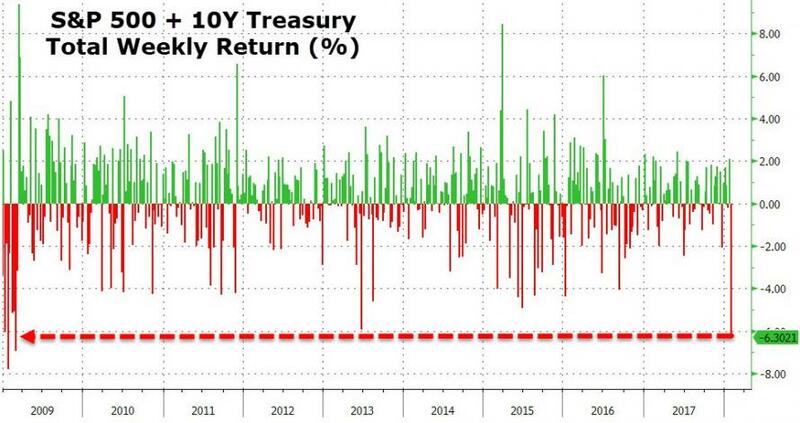 But to discuss the possibility of the worst bond bear market since 1981 - and then suggest those holding cash “are going to feel pretty stupid”? Seems to be a disconnect there somewhere. Going forward, I expect stupid cash to outperform scores of brilliant strategies. The historic “Financial Sphere” Bubble has ensured that ungodly amounts of “money” and leverage have accumulated in The Grand Crowded Trade of Financial Speculation. 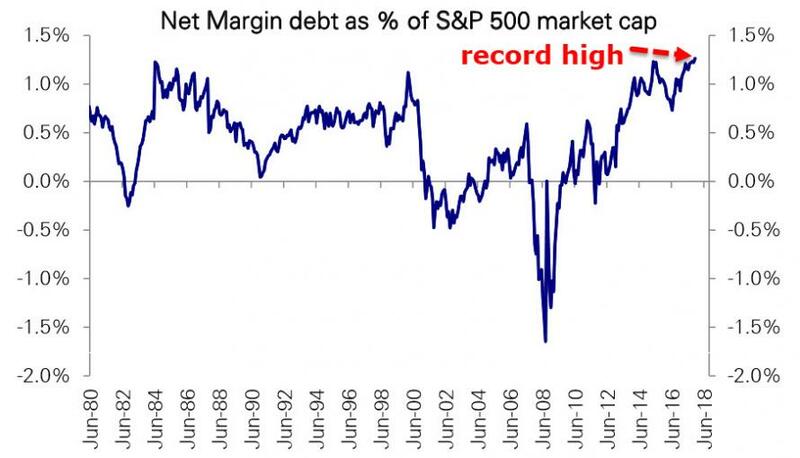 And as we detailed earlier - it doesn't get any more crowded that record long equities and record short bonds!